Posted by Qrystal on October 27, 2008 at 11:39. Laser Tag was amazingly fun! We’re all gung-ho about going again. The arena was big enough to get lost in, and it was all blacklit as shown in the picture here. 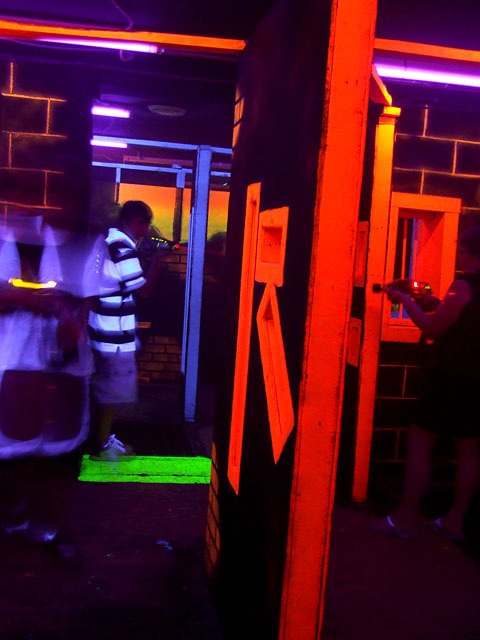 It was maze-like, with lots of walls and turns and passageways and multiple ramps up to the second and third levels, but it also has gaps in the walls and floors through which you can shoot or be shot (most are outlined in blacklight-glowing paint so you know they’re there). As a tall person, I had to crouch to see through the wall openings, but until I started doing that I would often get shot by the short people we were playing against. I also quickly learned to watch overhead, because I got sniped a few times! Our group of six played two games (each about twenty minutes). The first game put us against two teams of very young kids (6-8ish? ), and our team came in second place. (Hey, most of us there were complete newbs, so I’m just glad we didn’t place last!) In the second game, the kids were a bit older (10ish? ), and we got split into just two teams. Unfortunately, our team got stuck with some girls who didn’t seem into it much… they were walking around with some girls from the Red Team, treating the game like social hour instead of a competition. One of the rules we had to shout at the beginning was “I will compete!” and now I understand why! Anyways, despite this hindrance, we managed to squeak out a win — by just 55 points (where the total team scores were around eighty thousand). Good thing I thought to shoot one of the little glowing things on the wall; I found out later it was worth 60 points! Our team strategy seemed to work well: two or three people guard our base, while the others go to attack the other bases. When our attacking groups couldn’t get any more hits on the bases, they hear that their shots are “Denied!” and they come back to switch places with the defenders. Groups of two seem to be ideal for travelling through the maze, while a group of three makes a great defence for the base; larger groups in either case seem to be either confusing or redundant. I really can’t wait to go again! I’m seriously considering getting a membership, and using this as a sort of physical exercise. There is no running or jumping allowed, but it still ends up being fast-paced, if you’re doing it right anyways! :) I highly recommend the experience. Photo was from the XS Family Fun Centre website. They really need more galleries, so I think I’m going to offer my services. I’m sure I can figure out how to capture some really awesome shots!